There's a reason why readers tell us that our drug handbook is "the best that [they] have seen," or why reviewers say that "...the quality of this book is excellent..." Updated annually, the 2018 Nurse’s Drug Handbook is the most up-to-date, practical, and easy-to-use nursing drug reference. It provides accurate and timely facts on hundreds of drugs from A-Z. The new year may have just started, but we've already received a rave review for 2018 Nurse’s Drug Handbook from Doody's Review Service. Updated annually, 2018 Nurse’s Drug Handbook provides accurate and timely facts on hundreds of drugs from A-Z. Written in a no-nonsense style, it offers concise and consistently formatted drug entries organized alphabetically. New drugs include: bezlotoximab (Zinplava), brivaracetam (Briviact), daclizumab (Zinbryta), ixekizumab (Taltz), lixisenatide (Adlyxin), obiltoxaximab (Anthim), phentermine (Adipex-P), plecanatide (Trulance), prasterone (Intrarosa), and reslizumab (Cinqair). Did you know that you can bring 2018 Nurse’s Drug Handbook wherever you go with an affordably priced app for Android and iPhone and iPad? Try it free for 30 days! Having the latest information on drugs is essential for nurses. That's why we just published our 2018 Nurse’s Drug Handbook. Updated annually, it provides accurate and timely facts on hundreds of drugs from A-Z. Written in a no-nonsense style that speaks your language in terms you use every day, it offers concise and consistently formatted drug entries organized alphabetically. Review: 2017 Nurse's Drug Handbook "is excellent"
"As a reference, this one is excellent and it also serves the purpose of a textbook. What differentiates [it] from other drug references are the nursing considerations and patient teaching points." We're getting a head start on the new year with the release of 2017 Nurse’s Drug Handbook. Updated annually, it provides accurate and timely facts on hundreds of drugs from A-Z. Written in a no-nonsense style that speaks your language in terms you use every day, it offers concise and consistently formatted drug entries organized alphabetically. We are excited to announce the release of our updated Nurse’s Drug Handbook app. 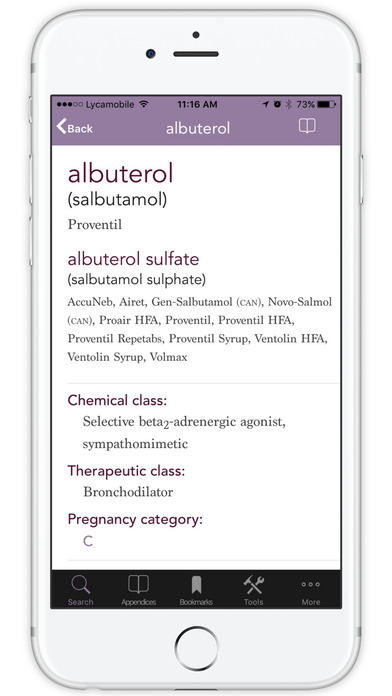 Available for iPhone, iPad, and Android, it lets you take the latest Jones & Bartlett Learning Nurse’s Drug Handbook wherever you go. The wait is over-- 2016 Nurse’s Drug Handbook is here. Updated annually, it provides accurate and timely facts on hundreds of drugs from A-Z. Written in a no-nonsense style that speaks your language in terms you use every day, the handbook offers concise and consistently formatted drug entries organized alphabetically. New drug entries: albiglutide (Tanzeum), apremilast (Otezla), dalbavancin (Dalvance), dapagliflozin (Farxiga), dulaglutide (Trulicity), empagliflozin (Jardiance), eslicarbazepine acetate (Aptiom), ferric citrate (Auryxia), insulin, inhaled (rapid acting) (Afrezza), naloxegol (Movantik), olodaterol (Striverdi Respimat), omega 3-carboxylic acids (Epanova), oritavancin (Orbactiv), sucroferric oxyhydroxide (Velphoro), suvorexant (Belsomra), tedizolid (Sivextro), umeclidinium (Incruse Ellipta), vedolizumab (Entyvio), and vorapaxar (Zontivity). Want your handbook on the go? Apps also available for Android and iPhone and iPad. Instructor Review: "Jones & Bartlett Learning Nurse's Drug Handbook is the best that I have seen"